Not to be confused with Air Hong Kong, Hong Kong Airways, Hong Kong Express Airways, or Dragonair. Hong Kong Airlines Ltd (Chinese: 香港航空公司), IATA: HX is a Hong Kong-based airline, with its corporate headquarters in Tung Chung and its main hub at Hong Kong International Airport. It was established in 2006. Based in Hong Kong, Hong Kong Airlines’ network currently covers over 30 cities regionally, including Beijing, Shanghai, Sanya, Bangkok, Bali, Tokyo, Sapporo and Okinawa. Hong Kong Airlines has a combined fleet of 34 aircraft. The current passenger fleet has 29 aircraft, which includes nine Airbus A330-300s, nine Airbus A330-200s and eleven A320s, with inflight entertainment system and an average age of around 4.3 years as of September 2016. The cargo fleet consists of five Airbus A330-200Fs. Robert Yip, the chairman of China Rich Holdings, with business interests in Chinese medicine, internet portal, construction and property development, established CR Airways in Hong Kong on 28 March 2001. The airline received its Air Operator's Certificate (AOC) from the Hong Kong Civil Aviation Department (CAD) with a 285 kilometres per hour (177 mph) 12 passenger Sikorsky S-76C+ helicopter in early 2002. It was Hong Kong's third commercial helicopter operator and the first helicopter operator to receive an AOC since Hong Kong became a Special Administrative Region of People's Republic of China. On 27 June 2003, CR Airways became Hong Kong's third passenger airline after receiving a revised AOC from the Director of Civil Aviation Albert Lam and operated its first passenger flight on the next day. It started passenger charter operations to Laoag, Philippines on 5 July 2003, with a Bombardier CRJ200 leased from GE Capital Aviation Services. In September 2003, the airline applied for traffic rights to operate scheduled passenger services to Laoag and Chinese cities of Jinan, Naning, Meixian and Wenzhou. In addition, Robert Yip sold 40 percent of the airline to his company, China Rich Holdings, for HK$180 million. By March 2004, the airline had added Siem Reap, Cambodia to its charter network. 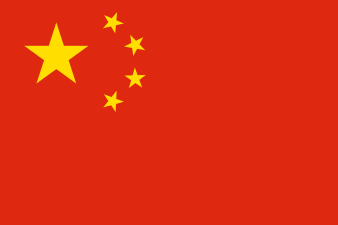 In April 2005, the Hong Kong Air Transport Licensing Authority (ATLA) granted a five-year licence to transport passengers, cargo and mail to China; the airline was free to apply for traffic rights to 10 cities in China. On 5 July 2005, the airline announced the purchase of two Bombardier CRJ700s from Danish carrier Maersk Air, scheduled to arrive in July and mid-August, respectively. In addition, the airline had signed a Memorandum of Understanding with Boeing for the purchase of 10 Boeing 787 Dreamliners and 30 Boeing 737–800s on 20 December 2005 at a listed price of US$3.28 billion. An executive of the airline had told reporters that some of the Boeing aircraft was from Hainan Airlines' order. On 27 June 2006, Hainan Airlines purchased a 45 percent holdings of the airline and the holdings would be transferred to Grand China Air, a new holding company of Hainan Airlines. Two months later, Mr Mung Kin Keung acquired the remaining 55 percent of the airline and became the controlling shareholder on 7 August; and its director on 13 August. On 22 September 2006, CR Airways Limited officially changed its name to Hong Kong Airlines Limited and a launch ceremony took place on 28 November 2006. The airline also introduced a new logo, which represents a bauhinia flower, the symbol of Hong Kong where the airline is anchored. The new logo also represents the close relationship between the airline and Hong Kong and its new era in the civil aviation industry. The airline made the biggest aircraft order in its young history on 21 June 2007, by ordering 51 narrow- and wide-body aircraft from European plane maker, Airbus, at an estimated value of US$5.6 billion. The airline's IATA code was changed from N8 to HX on 27 May 2007. On 24 October 2008, the airline announced plans in preparation for the arrival of the Airbus A330-200 wide-body aircraft, which included personnel and fleet composition. The new aircraft will provide medium haul passenger and cargo services to the Middle East and Australia. On 8 June 2010, Hong Kong Airlines completed their proving flight from Hong Kong to Beijing and return earning their Air Operating's Certificate for the Airbus A330 operations from HKCAD. On 28 June 2010, schedule flight to Moscow was launched. In September 2010, Hong Kong Airlines introduced its first airbus A330F cargo freighter, launched the first full cargo route from Hong Kong to Hangzhou. In 2011, Hong Kong Airlines awarded 4-star rating by Skytrax. Passenger traffic exceeded one million, serving 19 destinations. In 2013, Hong Kong Airlines launched new passenger route between Hong Kong and Maldives, passenger traffic exceeded four million. 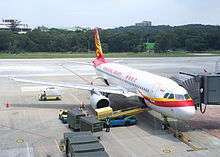 All Hong Kong Airlines' Boeing aircraft were replaced by Airbus fleet. In 2014, Hong Kong Airlines launched new passenger routes between Hong Kong and Ho Chi Minh, Tianjin and Kagoshima, and increased to four flights to Beijing and five flights to Shanghai daily. The new Hong Kong Airlines Lounge "Club Bauhinia" started operations on June 27, 2014, replacing the existing lounge. In February 2015, Hong Kong Airlines signed an agreement for sub-lease with the Airport Authority Hong Kong to develop a flight training centre on a plot of land of 0.6 hectare located at the southeast edge of the Hong Kong International Airport. In March 2015, Hong Kong Airlines joined the Executive Committee of the Board of Airline Representatives in Hong Kong (BAR HK), holding hands with another almost 80 airlines to improve the commercial and operational conditions for airlines active in Hong Kong. On 28 December 2015, Hong Kong Airlines flight HX658 bound for Okinawa became the first departure from the HKIA Midfield Concourse (MFC). On 28 November 2016, Hong Kong Airlines commemorated its 10th Anniversary with a grand celebration with distinguished guests which included government officials and business leaders. The momentous anniversary celebration was earmarked to launch the next phase of growth and expansion themed ″Flying Beyond″. ″Flying Beyond″ encompass further route expansion to current and new markets, fleet growth and expansion with the Airbus A350, enhanced customer service, amenities and facilities. On 20 December 2005, the airline signed a Memorandum of Understanding (MOU) with Boeing to acquire 30 Boeing 737–800 aircraft and 10 Boeing 787 aircraft. However, according to the airline's website, there is only a firm order of four Boeing 737–800 aircraft, with no mention of a firm order for the Boeing 787 aircraft. On 21 June 2007, the airline signed an MOU with Airbus to acquire 30 Airbus A320s, 20 Airbus A330-200s powered by Rolls-Royce Trent 700 engines and one Airbus Corporate Jet. The order was subsequently confirmed with the signing of a firm contract with Airbus on 12 September 2007 and it will be shared between the airline and its sister airline Hong Kong Express Airways. In December 2008, three of the original orders for 20 A330-200s were converted to A330-300s and transferred to Hong Kong International Aviation Leasing. They will be operated by Hong Kong Airlines. On 4 February 2010, Airbus announced another MOU signed with Hong Kong Airlines to acquire 6 more Airbus A330-200s. These will have Pratt & Whitney PW4000 engines and were originally ordered by Grupo Marsans. At the same time, one of the A330-243s on order was converted to a −343. At the Farnborough Air Show in July 2010, Airbus announced that Hong Kong Airlines had signed a MOU to convert orders for 15 A330s to A350s and place an additional order for 10 A330-200s. The airline converted an existing order for 15 A330s to the A350 XWB which will be delivered in 2018. No engine selection for the additional A330s was announced. In early 2011, there were rumours that Hong Kong Airlines had ordered 15 B747-8 aircraft, but such an order never materialized. At the Paris Air Show in June 2011, Hong Kong Airlines had announced a signed contract for 10 Airbus A380's  however due to China's anger with the European Union over plans to force all airlines to take part in its carbon-trading scheme, the Chinese government has blocked progress on Airbus’s sale of 10 A380s to Hong Kong Airlines. Normally, airlines in Hong Kong are not required to seek approval from the Chinese government to proceed with aircraft orders. The A380 cancellation became an issue as Hong Kong Airlines' parent, Hainan Airlines, is registered in mainland China, not Hong Kong SAR. In early January 2012, HKA's corporate governance head Kenneth Thong stated in a TV interview that the order was going ahead. In December 2012, CEO Yang Jianhong told Bloomberg that "We won’t resume long haul routes in the short term. The carrier is discussing changing at least some of its 10 on-order A380s for A330s, and delaying deliveries." The airline's head office is currently located on the seventh floor of One Citygate at Tung Chung, Lantau Island. The airline's head office was located on Level 2 of the CNAC House (中航大廈) on the property of Hong Kong International Airport in Lantau, Hong Kong. Hong Kong Airlines adopts sharp red and purple colour as the dominant colours and utilized in its uniforms and passenger cabin. HKA Holidays Limited (HKA Holidays) Sell different kinds of travel products, including fixed charter flights tickets, package and hotel accommodation. Under the brand positioning of "Fresh and Very Hong Kong", the new TVC depicted flight attendants practising Wing Chun, gymnastics and cycling respectively following Rose Chan, the Aviation Service Ambassador, Teng Haibin and Zhang Nan, the Olympic Champions, and Kenji Leung, the Cycling coach. with an aim to showcase the image of Hong Kong Airlines’ flight attendants. The airline was the aviation sponsor for the 2013 TVB drama Triumph In The Skies 2 (衝上雲宵II). and the 2014 Triumph in the Skies movie (衝上雲宵-電影版). Hong Kong Airlines is selected as the Official Carrier for Hong Kong Paralympic Committee and Sports Association for the Physically Disabled. Hong Kong Airlines has actively engaged in community affairs, including joining the Caritas Fund Raising Bazaars for six consecutive years since 2009 and sponsored the "World Diabetes Day 2012" Hong Kong events. As part of an approach to nurture aviation talents and encourage students to join the aviation industry the airline has a number of student sponsorship and aviation education programmes, such as "Triumph Sky High" Junior Programme, "Embrace the World" Student Sponsorship Programme and School Sharing Workshops. The Fortune Wings Club is a global frequent flyer programme designed for Hong Kong Airlines and its sister airlines, including Grand China Air, Grand China Express, Hainan Airlines, Hong Kong Express Airways and Lucky Air. Membership benefits include air ticket redemption and upgrade; VIP members have additional privileges of dedicated First or Business Class check in counters, lounge access, bonus mileage and extra baggage allowance. Hong Kong Airlines provides a wide variety of customer services at airports all over the world. 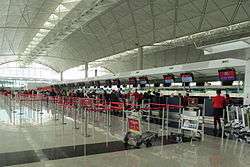 At Hong Kong International Airport (HKIA), the check-in counter located at Aisle K of Terminal 1. Hong Kong Airlines provides different priority check-in services for its passengers. In-town check-in stations of Hong Kong Airlines are located at both Hong Kong and Kowloon Station of the Airport Express Line for passengers to proceed check-in one day before boarding. Moreover, Hong Kong Airlines provides through check-in service. Passengers with flight connections on the following carriers can obtain their boarding passes for their onward flights upon checking in on their departure city. Hong Kong Airlines passengers can use electronic check-in service at the Hong Kong International Airport, and flights depart from Taipei, Bangkok, Beijing, Shanghai Hongqiao, Shanghai Pudong and Bali prior to boarding. Electronic check-in service include: Hong Kong Airlines Mobile Apps, Hong Kong Airlines Wechat, HTML5 apps and Hong Kong Airlines website. Entrance of Hong Kong Airlines Lounge "Club Bauhinia"
The new Hong Kong Airlines Lounge "Club Bauhinia" started operations on June 27, 2014. Located near Gate 23, Terminal One at Hong Kong International Airport, the 506 square-meter lounge accommodates up to 120 passengers. A brand new VIP lounge at Hong Kong International Airport Midfield Concourse (MFC) will be opened in early 2017. The new “Club Bauhinia” VIP lounge will twice the size of the current one located in Terminal 1. With a focus on environmental-friendly initiatives, it will be equipped with advanced facilities and amenities, serving exquisite and delectable cuisines, with distinguished quality and personal service to Hong Kong Airlines’ VIP passengers. All the aircraft in the fleet are equipped with WiFi service and an AVOD in-flight entertainment system. An In-flight Magazine "Aspire" is available to passengers with travel and lifestyle articles. ↑ Hong Kong Airlines – Hong Kong to Worldwide Air tickets, Online Special Air fares and Airline Reservation. "Hong Kong Airlines - About Us & Overview - The Company Profile". Retrieved 10 July 2015. 1 2 Hong Kong Airlines – Hong Kong to Worldwide Air tickets, Online Special Air fares and Airline Reservation. "Hong Kong Airlines - About Us & Overview - The Company Profile". Retrieved 10 July 2015. ↑ Wallis, Keith (8 November 2001). "China Rich to launch helicopter service". The Standard. Retrieved 2009-08-01. ↑ "CR awarded Hong Kong ticket" (PDF). Flight International. Reed Business Information. 26 March – 1 April 2002. p. 31. Retrieved 2009-07-30. ↑ Wallis, Keith (June 28, 2003). "CR Airways third airline in town". The Standard. Retrieved 2009-08-01. 1 2 "Directory: world airlines" (PDF). Flight International. Reed Business Information. 23–29 March 2004. p. 58. Retrieved July 30, 2009. 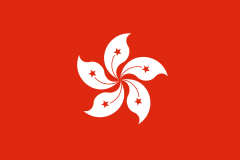 ↑ "Hong Kong regional starts up". Flight International. Reed Business Information. July 1, 2003. Retrieved July 30, 2009. ↑ "CR Airways plans fleet additions". Flight International. Reed Business Information. September 23, 2003. Retrieved July 30, 2009. ↑ "Hong Kong pair near China rights". Flight International. Reed Business Information. April 26, 2005. Retrieved July 30, 2009. ↑ "CRJ700s for CR". Flight International. Reed Business Information. July 5, 2005. Retrieved July 30, 2009. ↑ "CR Airways signs MoU for 787s and 737s". Flight International. Reed Business Information. December 20, 2005. Retrieved July 30, 2009. ↑ Loong, Alman (December 21, 2005). "CR Airways sets up deal to buy 40 Boeing jets". The Standard. Retrieved 2009-08-01. ↑ "Hainan Airlines takes large minority stake in CR Airways". Flight International. Reed Business Information. June 27, 2006. Retrieved July 30, 2009. ↑ ""Bauhinia is Our Heart, Soaring beyond Hong Kong Skies" The Launch Ceremony of Hong Kong Airlines Limited" (Press release). Hong Kong Airlines. November 28, 2006. Retrieved July 30, 2009. ↑ "HK Airlines inks deal with Airbus for 51 jets". The Standard. June 22, 2007. Retrieved 2009-08-01. ↑ "Hong Kong Airlines starts medium haul passenger and cargo service" (Press release). Hong Kong Airlines. October 24, 2008. Retrieved 2009-08-01. ↑ Cohen, Amon (November 11, 2011). "Hong Kong Airlines Targets 'Top-End Corporate Market' With All-Premium London Service". Business Travel News. Retrieved 2012-11-08. ↑ "Hong Kong Airlines to end London service". August 8, 2012. ↑ 伸延閱讀. "HX 3 架 A330VIP 宜家有咩用 ?? - 航空 - 香港討論區 discuss.com.hk - 一個香港只得一個香港討論區". Discuss.com.hk. Retrieved 2012-11-08. ↑ 伸延閱讀. "Hong Kong Airlines 2871一問 - 航空 - 香港討論區 discuss.com.hk - 一個香港只得一個香港討論區". Discuss.com.hk. Retrieved November 8, 2012. ↑ "Profile on Hong Kong Airlines". CAPA. Centre for Aviation. Archived from the original on 2016-10-29. Retrieved 2016-10-29. ↑ "Boeing Issues Statement on CR Airways' MOU with Boeing for 787s, 737s" (Press release). Boeing. 20 December 2005. Retrieved 2009-07-30. 1 2 "Our Fleet". Hong Kong Airlines. Archived from the original on July 31, 2008. Retrieved July 30, 2009. ↑ "Hong Kong Airlines selects Rolls-Royce Trent 700 for new A330 fleet" (Press release). Rolls-Royce. January 24, 2008. Retrieved June 12, 2010. ↑ "Hong Kong airlines buys 51 widebody and single aisle Airbus aircraft" (Press release). Airbus. June 21, 2007. Retrieved July 30, 2009. ↑ "Hong Kong Airlines seals Airbus deal at Asian Aerospace" (Press release). Airbus. September 12, 2007. Retrieved July 30, 2009. ↑ "Hainan looks to buy more aircraft leasing assets beyond Allco" (Press release). Flightglobal. January 8, 2010. Retrieved June 12, 2010. ↑ "Airbus announces Chinese MOU, delivery" (Press release). Seattle Pi Blogs. February 4, 2010. Retrieved February 9, 2010. ↑ "Hong Kong Airlines Selects Pratt & Whitney PW4000 Advantage70 Engines in $470 Million Deal" (Press release). PR Newswire. February 5, 2010. Retrieved June 12, 2010. ↑ "Hong Kong Airlines signs MOU for 15 A350s and 10 more A330s" (Press release). Airbus. July 20, 2010. ↑ "Boeing's website gives away Hong Kong Airlines order for 747-8I?" (Press release). Flightglobal. March 31, 2011. ↑ "AIRSHOW-Hong Kong Airlines behind A380 order-source". Reuters. Retrieved July 12, 2011. ↑ Joanne Chiu (June 14, 2011). 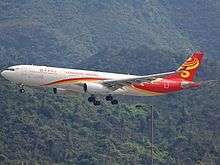 "Hong Kong Airlines to Order Superjumbo Jets". The Wall Street Journal. Retrieved July 12, 2011. ↑ Cantle, Katie (June 28, 2011). "Chinese government reportedly blocks A380 order over EU ETS". ATWOnline. Retrieved July 12, 2011. ↑ "Hong Kong Airlines places $3.8bn Airbus A380 order". BBC. BBC. January 7, 2012. Retrieved January 7, 2012. ↑ "Hong Kong Air Seeks A380 Order Swap for Smaller Aircraft" (Press release). Bloomberg. December 5, 2012. ↑ "Contact Us." Hong Kong Airlines. Retrieved on 16 May 2013. "Headquarters / Tung Chung Office Address: 7th Floor, One Citygate, 20 Tat Tung Road, Tung Chung, Lantau, Hong Kong" - Chinese address: "總公司 / 東涌辦事處 地址: 香港大嶼山東涌達東路20號東薈城一座7樓"
↑ "Contact Us > Hong Kong." Hong Kong Airlines. Retrieved on 7 November 2011. "Headquarter Office Address: L2 CNAC House, 12 Tung Fai Road, Hong Kong International Airport, Lantau, Hong Kong"
↑ "聯繫我們 > 香港辦事處." Hong Kong Airlines. Retrieved on 7 November 2011. "地址: 香港大嶼山香港國際機場東輝路12號中航大廈2樓"
↑ Hong Kong Airlines – Hong Kong to Worldwide Air tickets, Online Special Air fares and Airline Reservation. "Hong Kong Airlines – Hong Kong to Worldwide Air tickets, Online Special Air fares and Airline Reservation". Retrieved 10 July 2015. ↑ "电影冲上云霄内地首发 香港航空邀你一起"微探班"". Retrieved 10 July 2015. ↑ "Fortune Wings Club". Fortune Wings Club. Retrieved August 1, 2009. ↑ Hong Kong Airlines – Hong Kong to Worldwide Air tickets, Online Special Air fares and Airline Reservation. "Hong Kong Airlines Check-In - HK Airport Counters & In-Town Sites". Retrieved 10 July 2015. ↑ "Cinmedia - Inflight Magazine Production & Advertising Agent - ASPIRE About the magazine". Retrieved 10 July 2015. Wikimedia Commons has media related to Hong Kong Airlines.